Many garages do more than shelter a car. They’re packed with utilities, washer and dryer, home shop, yard and garden tools, plus overflow storage that won’t fit anywhere else. Building rugged, 3/4-inch plywood storage bins can solve the crowding and clutter. And you can tailor the assembly to build one that’s just right for your space. This version is 16 inches deep with three tiers of accessible storage- and wall mounted so there’s room to tuck one end of the car underneath. It’s cut from one 4-by-12 sheet- a special order at most lumber yards- including dividers and shelves planned out on paper ahead of time. *Materials. If the area is bone dry year round, use standard 3/4-inch plywood. If you need a dehumidifier and the masonry walls sometimes sweat, trade up to exterior grade. You could pay top dollar for veneered sheets good two sides. But for storage, a lesser (and less expensive) grade with some knots is fine. *Cutting plan. 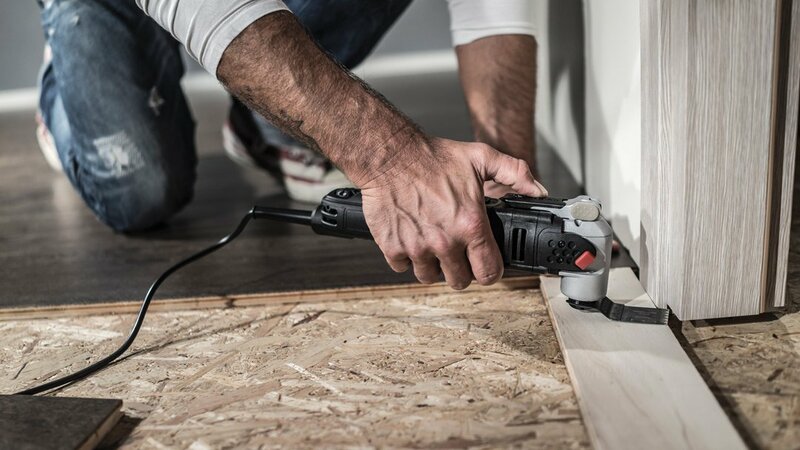 The 16-inch depth is more than enough for bulky items and power tools, and exactly one third of a full sheet. The one here loaded with tools worked out to two full-length pieces for the top and bottom, with the last third cut for sides, dividers and shelves. If you plan precise measurements, remember that you’ll lose about 1/8 of an inch per saw cut. *Joining. End pieces are rabbeted, the dividers and shelves dadoed, then secured with glue and screws. Even 1/8-inch-deep grooves- cut with a router or dado blades- lock the connections, and make the cabinet more rigid. Save time and insure accuracy by making each groove across top and bottom panels in a single pass, then ripping to size. *Assembling. If your cuts are good in a dry assembly, start on a flat surface and work from the bottom up, spreading glue into grooves, clamping, and checking for square. Wipe off excess glue while it’s wet, particularly if you plan to stain the bins. (Hardened glue blocks stain.) Then drive screws, drilling a pilot hole at all connections near the ends of panels. *Mounting. The wall mount uses two, full-length pieces of heavy-duty, 2-inch aluminum angle iron. Each is secured to the concrete wall with 2-inch lags, and to the plywood bin with screws. The bottom rail supports the load. The top rail keeps the cabinet from tipping forward. Full finishing is optional, but it’s wise to coat the edges of exposed laminations with clear sealer.